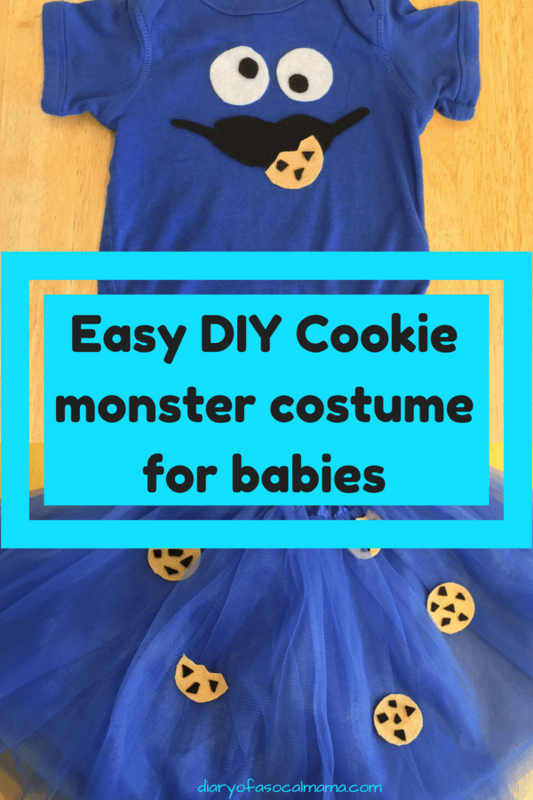 If you’re looking for a cute first Halloween outfit look no further than this DIY cookie monster costume for babies and toddlers. 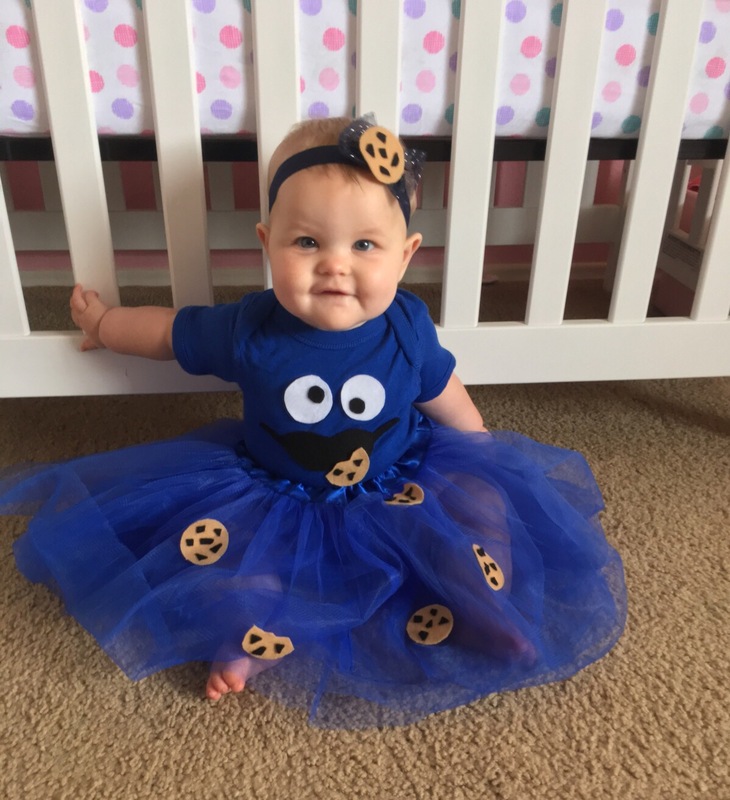 Who can resist an adorable baby and cookies? Especially if you have a chunky baby like mine. You could adapt it for a little boy by putting him in pants and a hat instead of the tutu and headband. This outfit is a bit time consuming but not overly difficult to make. You can grab a printable version of the directions with a guide for the pieces at the bottom of the page. Directions and guide are for personal use only and may not be used for commercial purposes. Post contains affiliate links. If you made a purchase through one of my links I may earn a commission at no additional cost to you. A hot glue gun and glue to attach the cookies to the skirt. 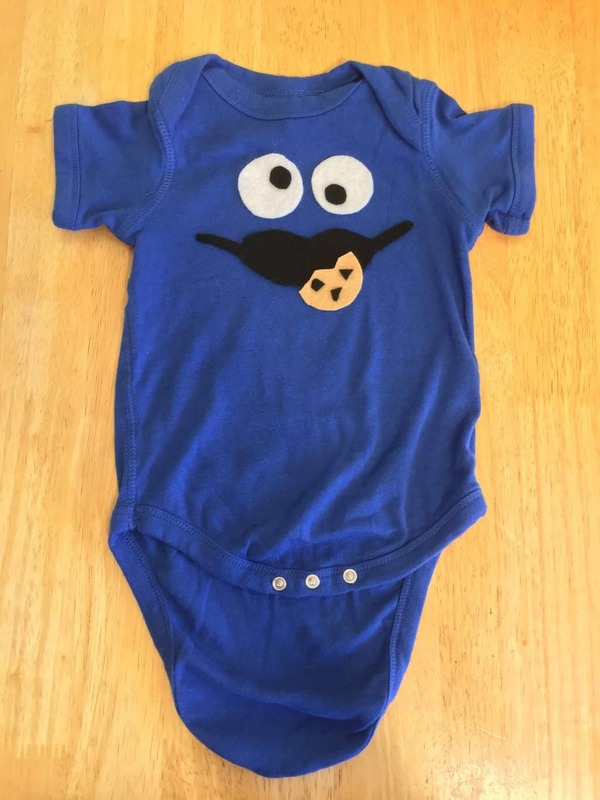 First, you’ll want to create your cookie monster onesie. Wash the onesie before you start to minimize later washing. This outfit should be gently hand washed as felt will pill if treated too roughly. Use your ruler to find the center of the onesie, armpit to armpit, or you can just eyeball the eyeball placement :). If you can, find an object in your house to use as a guide for the eyes…I used the inside of one of her stacking rings. Use the sharpie to draw a guide for the eyes on the white felt. You’ll glue this side down so the marks won’t show. Now you’re ready to start combining it all. (Place a piece of cardboard in the onesie before you start gluing so it won’t end up glued shut.) Glue the eyes to the onesie followed by the mouth. To make it extra cute glue a half eaten cookie near the mouth. When you’re done the onesie should look like the one above. Next up is creating the cookies. I made them the same size as the eyeballs. Cut them out of the brown felt. For the chips just cut some black felt into small pieces and glue them onto the brown felt circles. Looking for a guide? Click “Get the guide” at the bottom of the page. You can glue the pieces to the felt and just cut around them. Once it all dries you’re ready to take some pictures of all this cuteness! If you want to add the headband simply make one extra cookie and glue it onto a headband. I used one I already had in my drawer. You could use a blue, white, or black headband and they would all work with the outfit. Want a guide to making your own? Grab our cookie monster costume pattern guide! Want more costume ideas? 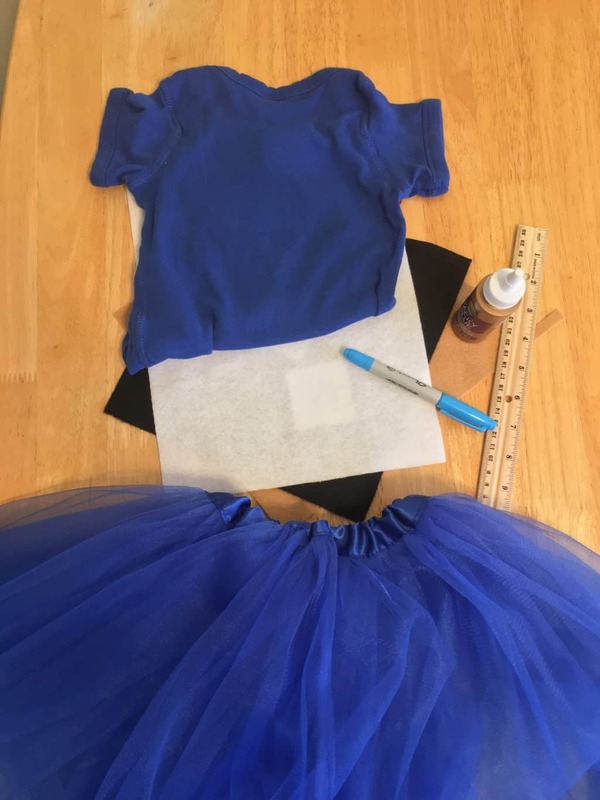 Check out this list of DIY Halloween Costumes for kids or this cute DIY M&M costume!